"Where does Brexit leave Britain"
According to Wikipedia Brexit (like its early variant, Brixit) is a portmanteau of "Britain" and "exit". The United Kingdom's withdrawal from the European Union. "Where does The United Kingdom's withdrawal from the European Union leave Britain"
...which makes no sense at all! Where (In what position, good/bad/awkward/terrible, etc) does Brexit (what you described in the question) leave (cause to be or remain) Britain (object of to leave)? The idiomatic use of the word leave is problematic, to be sure! Moreover, the sentence in question is, at best, poorly stated! Perhaps an illustration would help. Let's say two guys are bemoaning not having a suit to wear to a special occasion to which they've both been invited. One guy says, "I may not have a suit to wear, but I have a cousin who does, and we're almost exactly the same size. I think I'll ask to borrow his suit!" The other guy says, "But where does that leave me?" In other words, the "other guy" is feeling as though he's been left (past tense of leave!) out in the cold without a suit to wear. Getting back to "Brexit" . . .. The question being asked is "Where, or in what condition, does Britain's exit from the EU leave her?" The word where has nothing to do with a literal, physical location; rather, where means "in what condition." So, where is Britain, having left the EU? in danger of losing allies? in some other condition, either good, bad, or indifferent? Britain "leaving" the EU has no semantic connection to exiting; rather, the leaving has to do with a condition Britain might be left in, having exited the EU. Your plan is all well and good for you, but where does it leave me? Hey, my friend, we're both broke, but you have good credit and I have bad credit. You can go to a bank to get a loan to tide you over, but where does that leave me? Jim, I hear you found a date at the last minute for the party tomorrow. That's great, but where does that leave me? The sentence is intended to be read as, "In what state does Britain's leaving the EU leave it?" That is, where does Britain go after making such a decision? Is Britain better or worse off having decided this way or the other? What options are available to Britain now that it's made this decision? Normally in English, "where" type questions are referencing the relationship between 2 or more physical items and their relative location to each other. To answer a "where" question, one normally has to provide a second item to serve as a reference point for the location of the first item. For example: Where is my TV? Answers: On the table. In my house. In Texas. In the US. On planet earth. All of the above answers are correct to differing degrees of accuracy. I think most people's definition of "where" in the above context is easily grasped. However native English speakers, having fun with our language, will also use "where" to denote the status of non-physical relationships between non-physical "things". In the case you mention, Britain while being a physical landmass, is also an non-physical idea, specifically a political organization of people (a nation) who happen to mostly live on the previously mentioned landmass. The original question being posed is referencing this non-physical idea (the British nation) and is asking in relation to the EU (another non-physical idea, specifically a political alliance of nations) where will the British "stand". The "standing" is not a physical location, but rather an ideological "location". Ultimately what is being asked by this question is, will Britain continue to have a constructive relationship with the EU after it ceases to be an active State in the political entity known as the EU. What nations will fall into the Russian orbit? Nations won't physically orbit Russia, but if they come under the political influence of the Russian government they will often be referred to as being in the Russian "orbit". Will the UK and US become closer when the next president takes office? Again, physically their distance from each other will not change, but if the political goals of each nation become more aligned, then we use the word closer, which is normally related to physical distance, to denote a non-physical comparison in the status of our relationship. Hope this helps and hope I didn't add to your confusion. This is very similar to the rhetorical question, "Where do we go from here?" 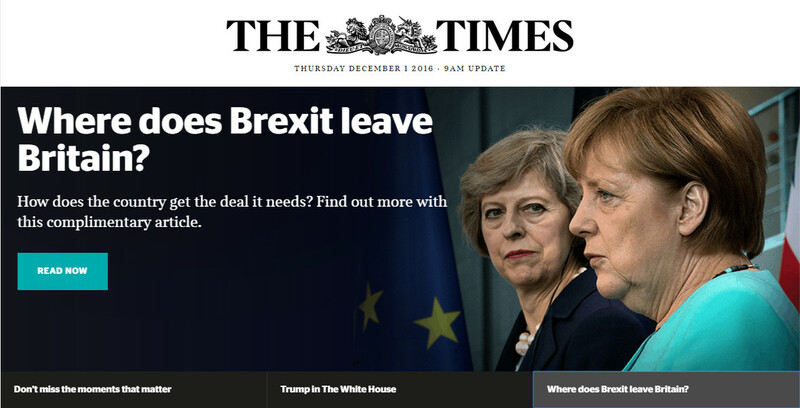 The newspaper is not asking for a location or making travel plans, but rather, it is pondering what will happen to Britain after a majority of its voters chose to leave the EU. Not the answer you're looking for? Browse other questions tagged meaning-in-context phrase-meaning headlinese or ask your own question. Could you help me define “reverse course” in this context? What does “ will be made or broken” mean in this context? What are the differences between “check it” and “check it out”? What does “by convention” mean? What does “over its turn” mean?